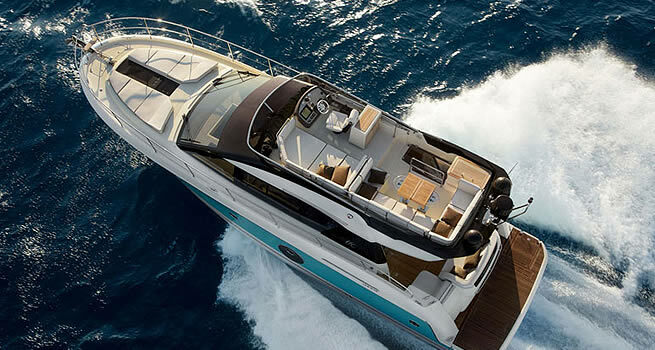 Monte Carlo is a new project with which Bénéteau is on the verge of revolutionizing the Luxury Flybridge Motor Cruiser segment. The new line will develop the key design elements of the brand of Monte Carlo Yachts which are currently produced from 60 feet upwards and will feature the same attention to detail which distinguish the boats produced to worldwide acclaim the Monte Carlo Yachts Italian shipyard. Now, the new Monte Carlo range is destined to make its reputation with the same approach and the same values: motorboats with a classic yet innovative style. Addressing the need for more responsible boating and re-examining the value of using luxury goods and finishes, together with the decision to combine the industrial know-how of Groupe Bénéteau, the world leader in leisure boating, and the quintessence of Italian boat design. Classic for the style they share with MCY. Future because they are “out front” in every sense. The Monte Carlo range is the fruit of a special collaboration between Bénéteau's design office - whose know-how in the design of hulls is second to none - and the designers Nuvolari & Lenard, who lend their unique talent to the style as well as the whole interior layout, in addition to the designer Pierangelo Andreani for the layout and interiors. The collaboration between the naval architects Tanguy Le Bihan and Patrick Tableau has produced this new hull called the “wave-splitter”. Its highly profiled bow has been specifically designed to slice through the waves in all sea conditions giving improved seaworthiness and ride comfort. Comfort at sea is maintained and performance is improved by 8% in relation to the choice of a traditional hull. Tank and wave tested, her performance was assessed and the hull lines optimized. The architects chose to give the bow a tulip shape to enable better wave deflection. The boat runs flatter and the trim angle is improved giving clear visibility.